Sounded like as gooda’ name as any. Nice wood combination that you won’t see often. I love sycamore despite its tendency to warp, cup, and twist. The sleek lines set this box apart from your others. Lines, proportions, and material contrast all combined so nicely. Well done! It certainly looks a lot different than it did in the warehouse. :) Great design as usual. I enjoyed meeting you and Carol at the show. The weather turned out to be perfect for Houston. I hope you did well enough at the show to return next year. Greg, this is yet another look for you. I don’t remember one with this style. What technique did you use to round the sides so symmetrically? Nice color contrast. Good luck on your next show. Go with the artistic flow. I’m thinking this and the last one might be less labor intensive than the sculpted boxes? You do nice work Cajan dude! LOL! Greg, very nice box. I love the wood contrast and the design. Excellent job. Thanks everyone…I always value and appreciate your most generous comments. Andy…this is the first time I have used Sycamore…but from what I understands the quarter sawn Sycamore is stable and the flat sawn is the cut that has problems…I hope I am correct in my understanding. It was also good to meet you. Bayou City was a great show for us. This is our 3rd year doing it and I look forward to doing it again if they jury me in. We have repeat customers that have come back each year to buy and I take that as a huge compliment. Greg, this is yet another look for you. I don t remember one with this style. What technique did you use to round the sides so symmetrically? Nice color contrast. Good luck on your next show. Al…I used my table saw to rough it out and then fine tuned it with a block plane and hand sanding. It was quite easy. Greg, That is pretty much the case. Yours looked flatsawn as I didn’t see any of the ray flecks characteristic of QS. Beautiful work as usual. Do you have any reaction problems with the Wenge? 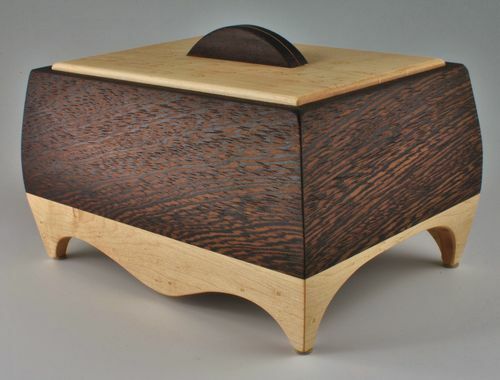 Nice box design and Great wood combo.